I think I've had one or two dreams about shredding away from zombies before, never thought I would see someone make a short movie out of the concept though. Was totaly shocked at the budget, thought it would be WAY higher. Awesome video! Honda element kelly bluebooks best choice for post apocalyptic vehicle. The largest exspense was probably his bike. Yeah, the behind the scenes was very good, you don't really realize the effort that goes into cinema versus just riding your bike. @Ryanppv8: Poor fuel economy though, he used quarter of a tank just driving up a hill. @upchuckyeager: yuck. The other guy thought the element got bad mileage..
Great video, especially considering the budget, if you had more access to extras for the biking section it would have been great to see them on the outsides of corners or inside a gap reaching up to the rider or eating something. Or maybe reaching up to him as he rips across a log ride. Best thing ever would have been a scrub to the face. *Is so good. His work with Nic Genovese as Mind Spark Cinema is amazing. @home-team: Man that Hurts. Kids these days are viiiiicious. Aaron not making videos anymore? the Monday video still give me chills! @poutine: Aaron is one half of Mind Spark Cinema and they've been super busy shooting for Sram the past few years. They also just made the Specialized movie ''Motive'' last year. I'm being a mountain biker for halloween! Still one of the most memorable short bike videos ever! notice how straight up he was sitting and how he was ripping those corners. he might be on one of them new short reach bikes that we've been hearing are coming. apparently, this new geometry is a more upright stance that requires less exaggerated body motions to get over the front end to find cornering grip. bike companies think of everything, can't wait to try these new bikes out! Should have been the original version of She's not there. Or something else by The Zombies. From now on I have to remember the #1 rule- "when zombies are chasing you, get out of your vehicle, and go for a bicycle ride in the woods" systems check; and check. Nevermind, didn't notice they ran out of gas. I have wanted to make this video for the longest time. Only with downhill bikes, obviously. So riders can whip zombie's heads off. I never thought the trails behind my house would be in a mountain biking edit on Pinkbike! This is awesome! Some of those trails are my favorite to ride. Thanks guys!! Thats funny...part of my preps aside from all my firearms and everything else are my Ripley (for me) and my Reign (for the Mrs). A 29er with a more aggressive geometry was my first choice for a zombie outbreak , considering that majority of the riding will probably on fire roads with some technical trails sprinkled in. @Zuman: madmax comuter bike complete with razor wheel attachment and panier bags full of genades and amo. Light blinder helmet mount feature and quick release zombie lance. Oh ,and elbow pads. No narrow-wide to the head? Wasted opportunity. Hahaha Strahan this is amazing! It was great the first time I saw it, gets better with age! Yep, it's a classic! Always nice to revisit it. You guys made a great zombie movie. Forget the bike and waste more zombies! hahah sick!! that was so much fun to make! cheers dudes! Damn! Damn...damn! I'd wana die in the first wave, get it over quick. I'd hate to go out due to a pinch flat. Great work! thats what you look like without a beard. I completely forgot. @EdFernie: so he looks 46? Oh! And in case anyone's wondering, the trails behind my house are the Cobble Hill trails. QUESTION: why are so many of LaRock's videos locked?!?!?!?!? I asked him that before. Music copyright issues. Damn greasy roots will get you ever time! 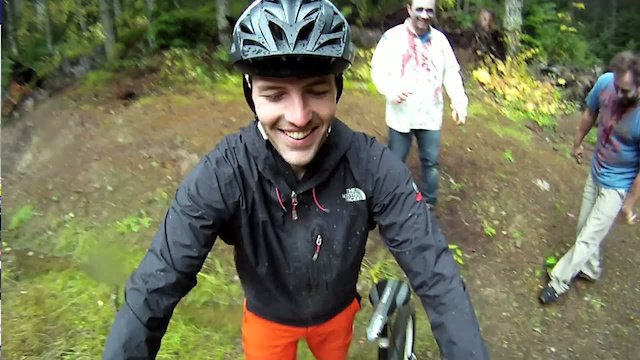 the biking dead...well done vid. 26 might just be dead?